Selkirk, New York is the biggest yard in the Northeast, and is now owned by CSX. We spent two frigid days at Selkirk in February, 2000 to bring you CSX in the snow from both ends of the yard. The west end for the Chicago Line and the east end for the Boston Line, the River Line and the branch to the Port of Albany. Selkirk has always been an exciting place to railfan, and is even more so when the snow flies. Check out the Notheastís favorite hot spot! Nikhil Murthy (Washington) on 2018-04-09 20:24:34. 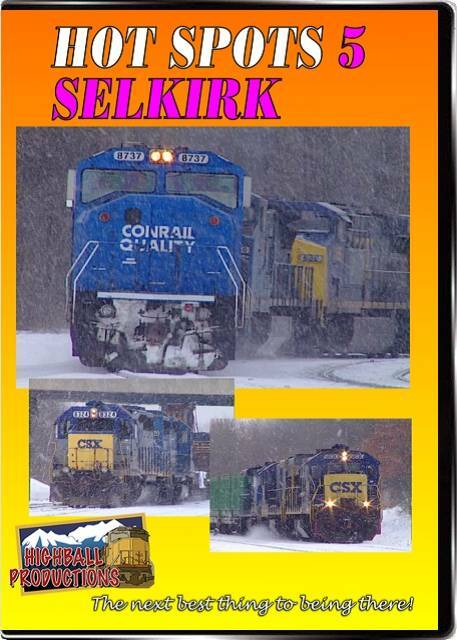 This program covers a visit to Selkirk Yard on a snowy February 3 and 4, 2000. The photographer filmed from the Route 9W overpass on the bridge as well as on the ground on the first day. He then filmed from the west end of the yard as well as at Game Farm Rd. on the second day. One of the things that I really like about this program is that timestamps are used to showcase when each train showed up. The first day was filmed starting at 9:10 AM and the last train being filmed at 4:40 PM and the second day was filmed starting at 9 AM and the last train was caught at 3:45 PM. The BEST runby in this program in my opinion occurs at the 12:50 PM timestamp on the second day where initially there is one CSX train furthest from the camera and then moments later another train shows up on the track closest to the camera leading to a train race and the train closest to the camera gradually speeds up and both of the trains are shown in their entireties. In addition, the squeal of the wheel flanges getting louder as the train speeds up adds to the drama of the runby. I'm extremely sure that only those who purchase the program and see that one runby for themselves will definitely agree that this is one of the best train race runbys ever captured on video.